Well I don't know if I've ever had travel expectations blown out of the water like they were when we visited Florence, Oregon and the Oregon Coast. I mean, I've always heard, "You HAVE to go to the Oregon Coast..." and I knew going into the trip that I'd probably like it, amid the wind and clouds and rain and blah, blah, blah. But what I didn't realize was that I would love Florence and the coastal beaches we visited—and there was absolutely no way I could have predicted how much fun I was going to have when we got there. It was the best (and first!) friend-cation to date! We went with our good friends Jason & Andi to the coast over the long Memorial Day weekend. We battled rain on the road trip through Oregon, but by the time we finished our lunch in Bend, it had mostly cleared up. We enjoyed treats at Voodoo Doughnuts along the way (yum!) and made it to Florence on Friday. The skies were blue with a few clouds and it was a bit brisk, but we braved the wind and headed to the beach before dinner. The beach in Florence was beautiful, and so different than the beaches I'm used to in Seattle, Washington. We don't really get waves or expansive beaches like that in Seattle (where I "grew up" (kind of) and visit annually) so I really enjoyed these beaches. We walked up and down them until sunset. We enjoyed dinner that night at the Bridgewater Fish house and were more exhausted than we thought after the long drive. We were lights-out shortly after dinner! Our rented condo for the weekend was right in the heart of downtown Florence on the Siuslaw River. It was above a nail salon and was a "party in the front" with the storefronts, restaurants and taverns at the front of the condo, where the master bedroom was (perfect for trying to fall asleep at night with the tavern music blasting! ha!) and "peaceful in the back," where the guestroom, living room, and deck overlooked the river. It was such a fantastic vacation rental and was the perfect fit for our two couples. On Saturday, we got ourselves ready and headed toward Yachats to find a beach for agate hunting. Along the route, we stopped at Bob Creek, just to check it out since it was right along the road and looked like a rocky, pretty beach. We thought we "might" find some agates there. As soon as we got there, I stepped onto the beach and found an agate. And then another. And then another! 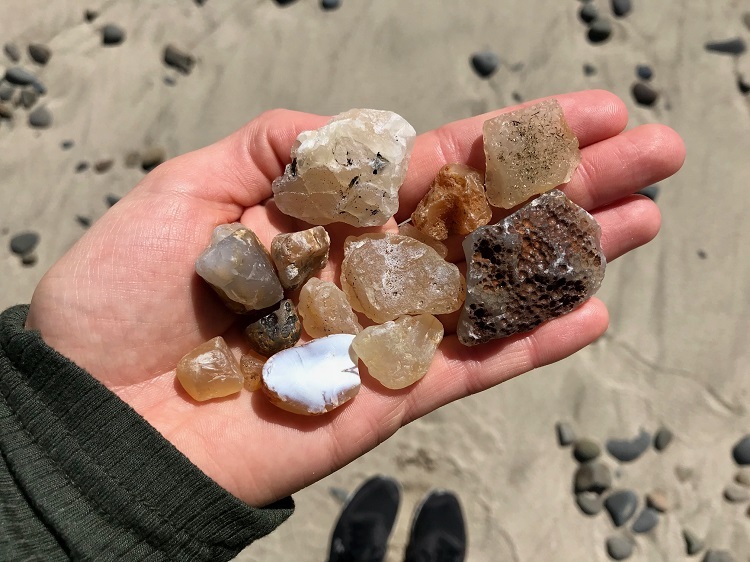 I kept finding agates almost at every step along the half-mile of beach—it was fate—that was the beach we were destined to be at for the day. We ended up spending two hours there and Daniel and I together found 235 agates! In the photo above, there are 107 agates (the ones I found) in two hours at Bob Creek. To say that the Oregon beaches blew my past Washington agate hunting adventures clear out of the water would be an understatement. I cannot believe the abundance of agates at the beaches. I would bend over to pick up one decently-sized agate and would find 10-20 tiny others right around it. My best strategy for agate hunting is to WALK. 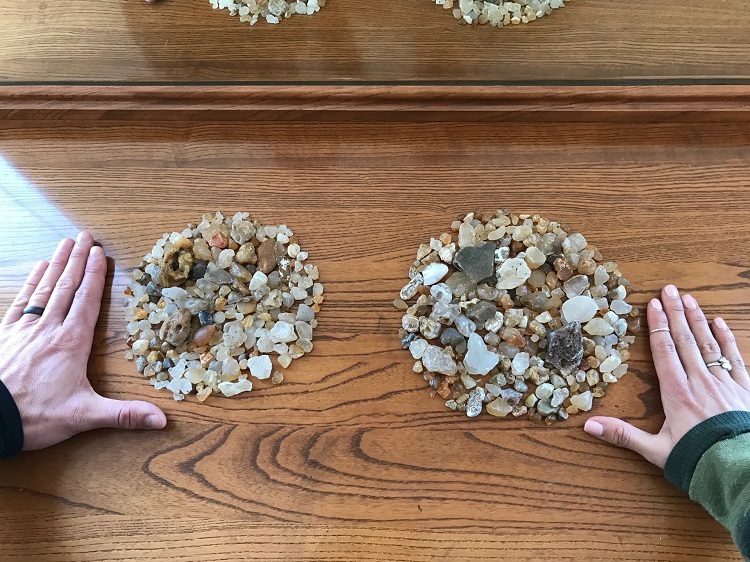 Do not sit and dig—you'll only find baby agates—instead walk and scour to try to find the bigger, more impressive ones. There was also a really cool cave at Bob Creek and it marked as far as we went on that agate hunt. All four of us found a bunch of agates. One of my favorites was Andi's black agate, and another one was Daniel's with a geode core. Too cool. 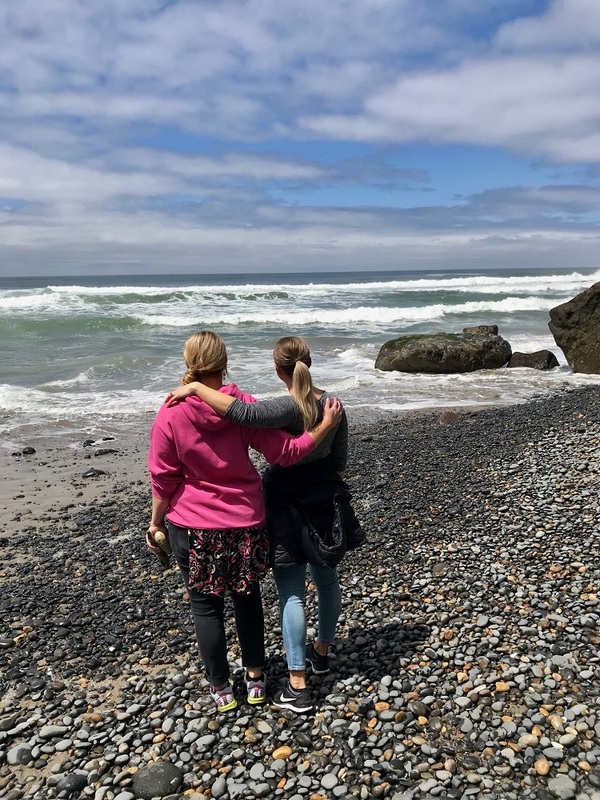 After two hours of agate hunting, we traveled the rest of the way to Yachats to eat ling cod fish and chips at the Luna Sea Fish House. Boy, that was the BEST fish we had on the entire trip. It was incredible. After we stuffed our bellies, we topped it off with double scoop ice cream cones from Toppers in Yachats. 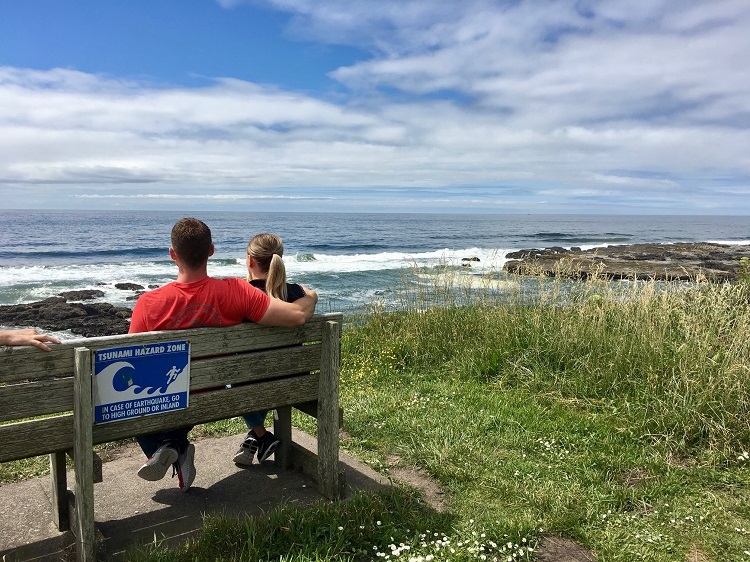 We enjoyed our cones while we watched the waves splash the cliffs of Yachats. The best thing to do after spending the morning in the sun, stuffing your belly with food, and topping that off with ice cream is—of course—to take a nap. So power nap we did before we headed off on our next adventure. Jason raved about this little floating chowder house called Novelli's Crab & Seafood off the boardwalk in Florence, so that's where we decided to do dinner. We all ordered crab chowder and garlic bread, and I'll be darned if it wasn't the best crab chowder I've ever had. I can't say it's better than Ivar's clam chowder, but it was some stinkin' good chowder for sure. After dinner, we decided to go try one more beach for agates and to watch the sunset. Jason brought his kite, so he flew that while we dug in the rocks for agates at Big Creek beach. Now, I won't say we didn't find any agates at that beach, because we did, but it is not the kind of place you'd want to go agate hunting. There weren't any agates on top of the rocks, but if you got past the first layer, you might be lucky to find a few. 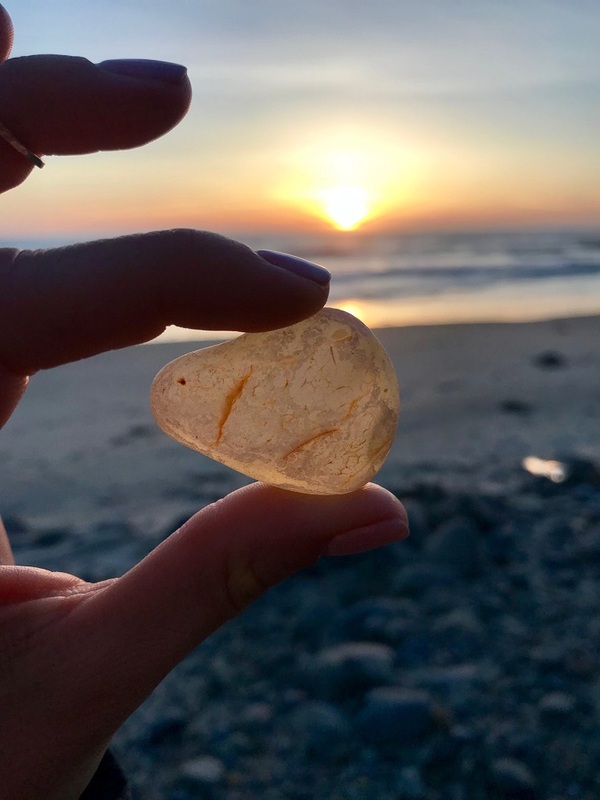 As we watched the sunset, I found the agate below—one of my biggest of the whole trip. 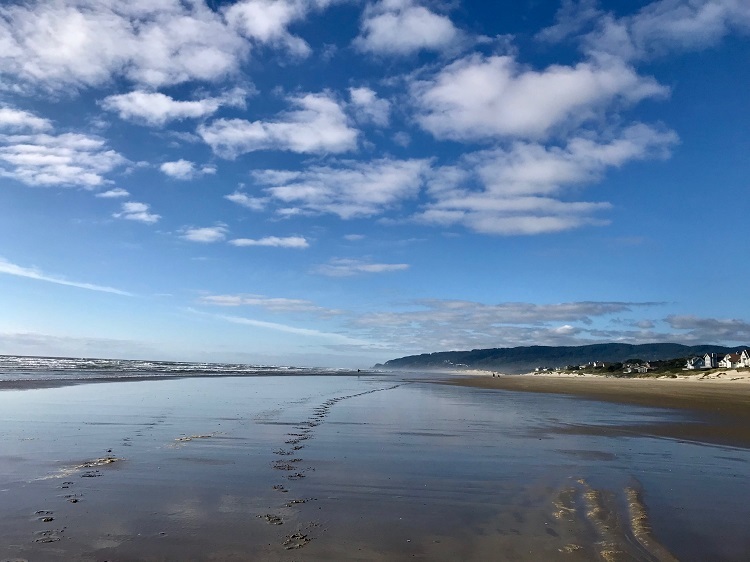 Again, some of the random beaches between Florence and Yachats are not ideal places for agate hunting, but that beach afforded us a few agates, so we weren't disappointed. We just wouldn't choose that one again. Keep reading, and I'm sure you'd agree! That evening after the sun was down and we weren't quite ready for bed, we visited the Three Rivers Casino in Florence. I wasn't so keen on the idea of casino-ing it up since I'd never gambled (shocker! ), but I went along for the ride. While I didn't hit the jackpot, I ended up having some fun on the Deuces Wild poker machine and won just a bit of money ($10). I put in a $20, and once I was up a bit and hit a Royal Flush, I threw my hands up, declared myself done for the night, and skedaddled with my $10. It ended up being a slightly profitable (and lucky, most likely) trip. We topped off our casino fun with a lively (and LATE!) game of Catan. Note: do not start Catan at 11:30 pm and expect all players to be enthusiastic and awake for the duration of the game. On Sunday morning, I woke up early and ran along the boardwalk in Florence and around the quaint town. I loved looking at the cute houses, rhododendrons, and beachy cottages. I've been taking it easy with my running lately due to injuries and following a different training plan, so after jogging around the town for a bit, I slowed it down and just walked, admiring the flowers, river, and little town of Florence. After Saturday's agate-hunting success, we were ready to tackle a new beach. 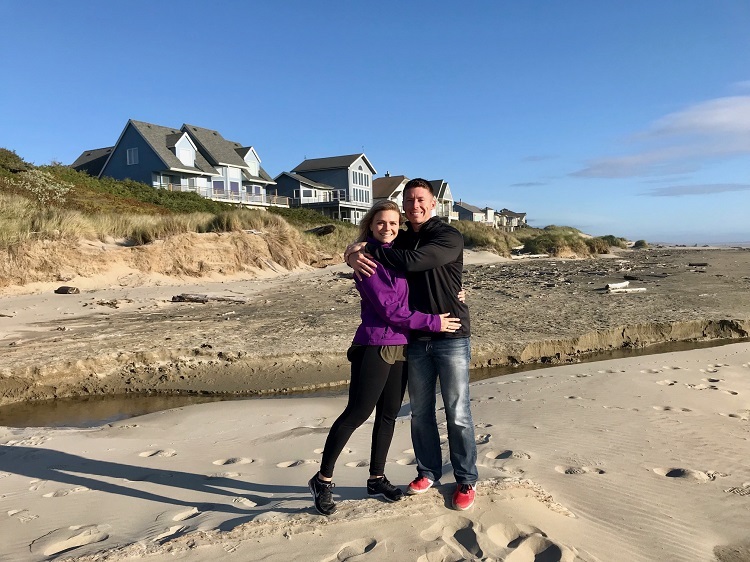 We ventured off toward Yachats again, after Google reviews told us anywhere along that coastline was the best chance for us to be successful. Stonefield Beach popped up in one of the top hits, so when we passed its marker on the highway, we pulled off to check it out. It wasn't but a couple steps onto the slightly rocky beach (similar to the photo below in contrast to the photos above) when we were bending over and picking up several agates each, all bigger than we had been finding the day before. There were fewer agates at Stonefield, but they were greater in size and pretty fun to find because initially looking at the beach, it's not a place you'd expect to find many agates. The photo below is what I found in about 45-minutes on the small rocky patch of beach. We did not make it to the other side of the river at that beach, and I'm sure there would have been more had we been able to cross the small river. Since that beach wasn't too big, we combed over the rocks pretty quickly and decided to try a new spot. It was sunny on Sunday, but really windy, so we were trying to find a beach that might be a little more sheltered, similar to Bob Creek. A few minutes later, we came up on Strawberry Hill beach. 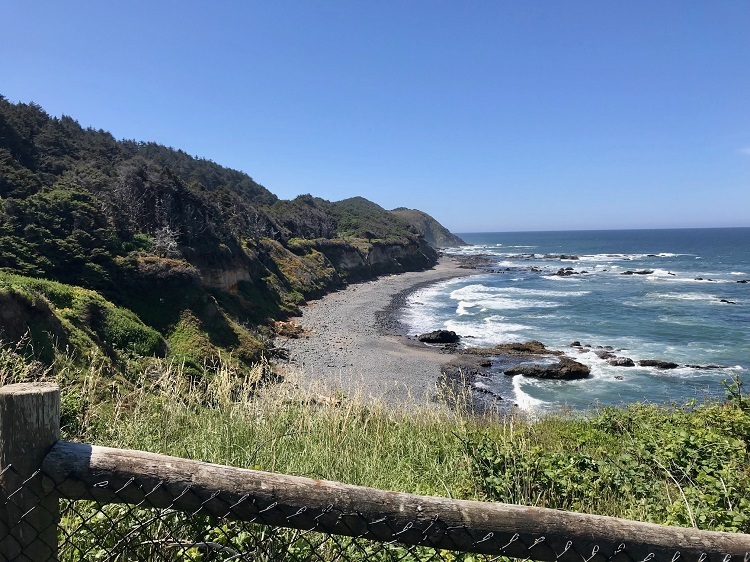 We didn't remember seeing Strawberry Hill on any of the Google results for top agate spots, but it was still along that highway between Yachats and Florence, so we decided to give it a go. After seeing the rocks at the bottom of the hill, we knew we had to go down and just see if we could find any. Bottom line up front, YOU GUYS—this was THE beach for agates!!! Now, back to the story (because really, do you even care about agates like we do? No, you're not weird). Strawberry Hill was a gorgeous beach. There were so many seals in the water and lounging on the rocks just off the beach. It was a great place to watch them play in the water. I kept hoping I'd see a shark fin or something really cool go down, but unfortunately all I got was the seals. Maybe next time! (Do you guys get excited about sharks? I am all about seeing a shark... shark diving would be so cool!). The other great part about Strawberry Hill was that there was hardly anyone there. There had been a lot of people at Bob Creek, but we pretty much had Strawberry Hill all to ourselves. I wasn't complaining! 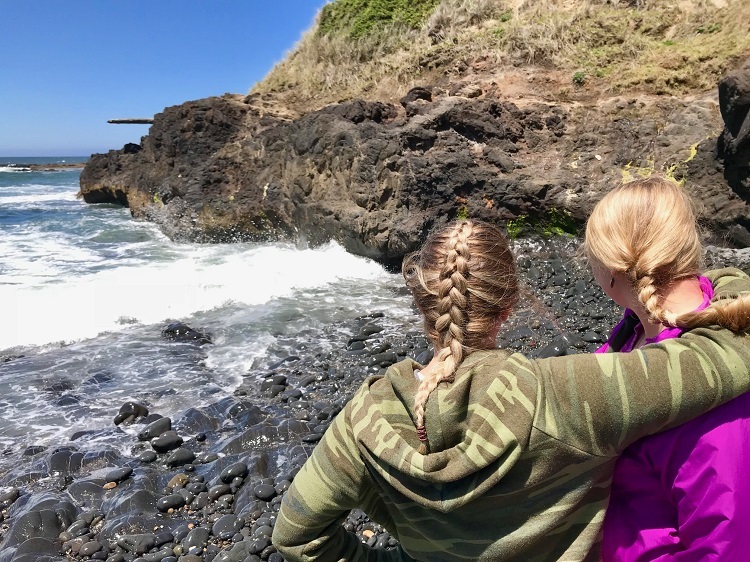 Andi and I sported some fun beachy braids for the day. It was so fun being with friends on this vacation. So I mentioned above that the agates at Strawberry Hill were the best. Does it help quantify "the best" if I say that I alone found 252 agates (252!!!) over the period of two hours? What if I also told you that Daniel found 231 on that same walk? That means that combined, the two of us found 483 agates in the same two-hour period. You guys, four hundred and eighty-three. Holy moly. That's four agates a minute! Need proof? Check out below! I sent that photo to my family, who promptly replied with the :-O face emoji. That one agate haul trumps our entire seven years of agate collecting by about 600%. Not kidding. 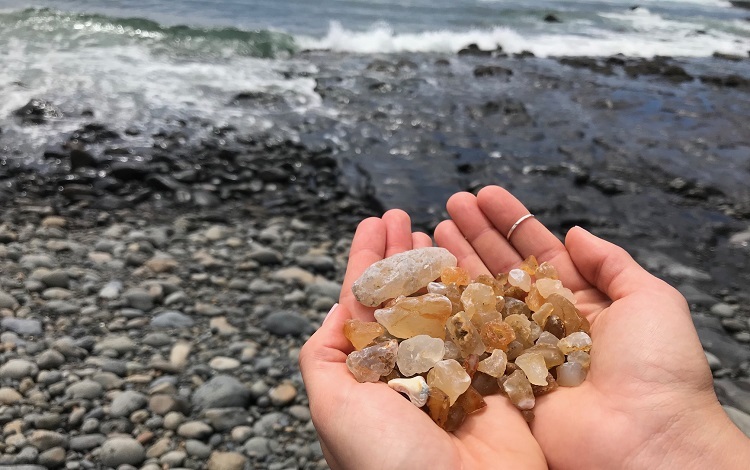 If you want to find agates, go to the Oregon Coast. After our eyes uncrossed from all the agates, we realized we were starving so we headed back to Florence for lunch. We enjoyed an ahi sandwich and pizza from Restobar and wandered the downtown area of Florence, browsing the shops. We finished up with a stop at BJ's Ice Cream before retiring to the condo for the evening. While everyone else took a quick power-nap that afternoon, I slammed out some homework for my Master's program before we all caught up and grilled some fresh oysters with cocktail sauce. That was an experience and we all were laughing as the guys tried to shuck those suckers open. After grilling out, we capped the evening off with a few rounds of Monopoly Cards. That was a fun game! 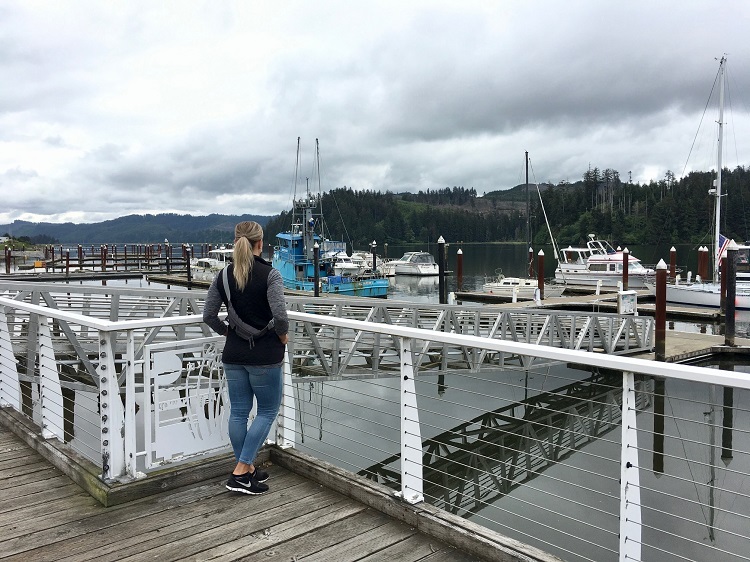 We drove home Monday morning, stopping to enjoy breakfast in Sisters, Oregon and visiting some cute gas stations along the way. In case you did the math above (and since I need to bring up agates one more time), Daniel and I, over the period of two days, found 718 agates. 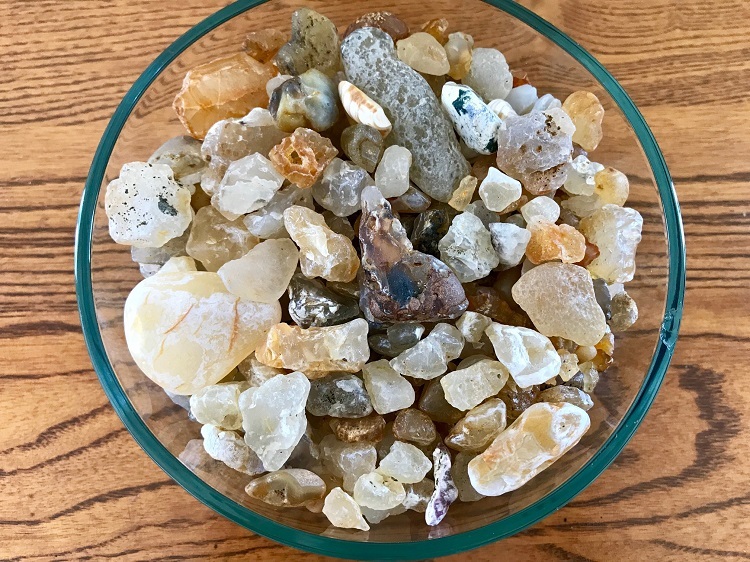 It may not look like a lot (below), but they fill up a big glass vase at home, and they're about 700 times more than all of our Washington agates that have taken us seven years to find. Just saying. Overall, our Oregon friend-cation was absolutely too fun. 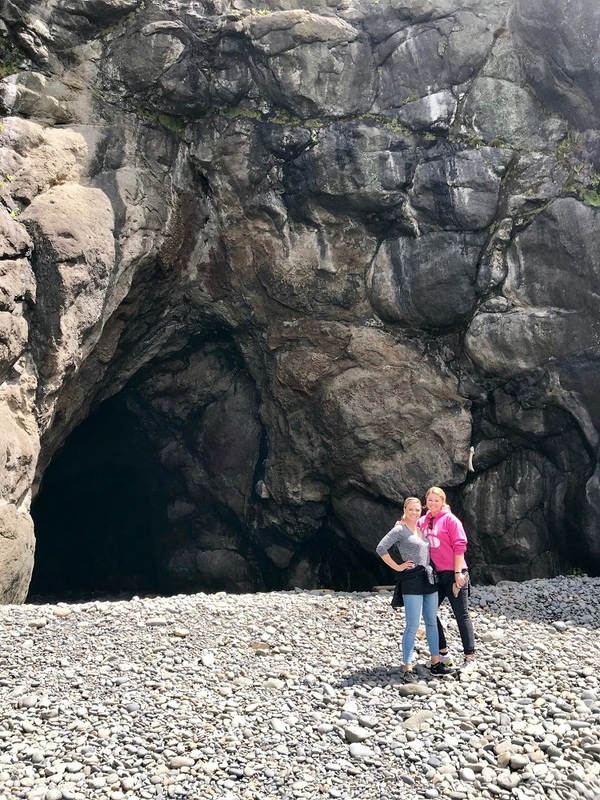 I meant to write this up as a short post and just add a few photos, but it was such a perfect trip that I had to tell the story to do it justice. We have been on family vacations and solo trips before, but this was my first couples friend-cation, and I don't think I would have changed one thing about it (except for possibly making it longer). Jason and Andi were such a blast to be around, and all the joking, laughing, stories, and sarcasm we shared over the four-day trip was a memory that I'll hold close for a long time. 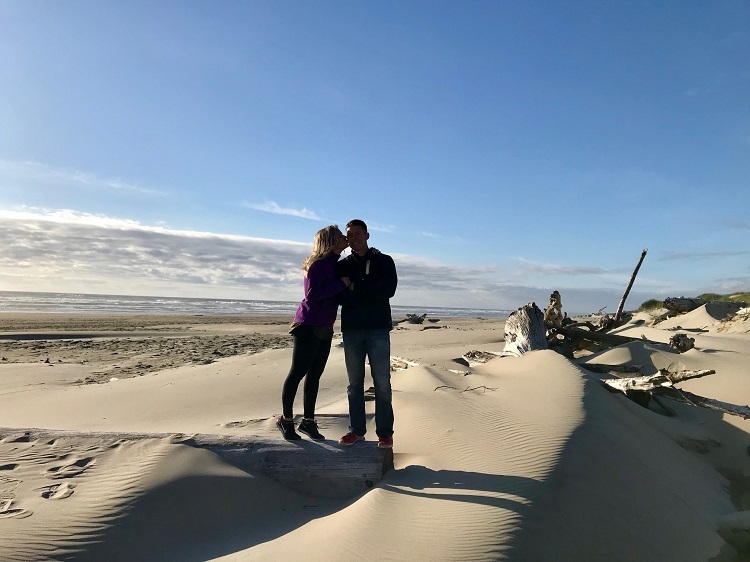 Oregon Coast... we'll be back!